Vigil is a new Off-Broadway comedy that revolves around the relationship between a nephew and his dying aunt. Their shaded familiarity and endearing discomfort is examined in the simple setting of her bedroom. At first glance, the plot of this play sounds like a total snore, but the chaotic way in which the play unfolds and the heaping portion of bitter comedy makes me want to hang out at funeral homes. 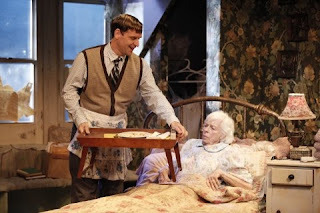 The play opens with Kemp, the nephew, leaving his job and home in order to care for his ailing aunt, Grace. Although this seems like an incredibly selfless and responsible thing to do, Kemp is revealed to be a bit off-center as he is clearly only waiting for his aunt to die. Grace is strangely unfazed by his abhorrent behavior, even while Kemp continually talks about death and even plans her funeral. After Kemp and Grace pass a year together in this fashion, an elderly woman across the street passes away. Something uncannily links this dead woman to Kemp, and he realizes that he might have made a mistake. The format of Vigil is very unique, with short rambling monologues from Kemp and many blackouts, making the play very fast-paced. Both actors portrayed their characters with specificity and nuance. Grace doesn’t speak at all until the end of the first act, and even in the second act, she only speaks a few times. I commend both for holding the audiences interest throughout the whole show, with one constantly speaking and the other hardly ever opening her mouth. The set is detailed and convincing, and the subdued madcap music reflects on the dark and hilarious nature of the play perfectly. I would recommend Vigil to anyone looking for a sharp and witty play. HOW TO SEE THE SHOW: $20 student rush tickets. DR2 Theatre 103 E. 15th Street.